Intelligence agency GCHQ has cracked secret codes hidden by the man behind cult comedy character Frank Sidebottom.Chris Sievey drew cryptic symbols in artwork around the borders of some of Frank's fan newsletters, football programmes and record and tape sleeves.Sievey died in 2010 and the codes remained secret until the director of a new documentary took them to GCHQ.A crack team of codebreakers revealed that the messages said things like: "Why does my nose hurt after concertsThat's a reference to the nose peg Sievey wore under Sidebottom's giant head to give the character his trademark nasal voice. Sievey, from Manchester, told friends and family he was hiding important messages in code.Director Steve Sullivan, whose film Being Frank tells the story of Sievey and Sidebottom, took the rows of symbols to several codebreakers, but none could help.Sullivan told BBC News: "My own attempts to crack it proved absolutely futile. I spent a while just looking at them going, 'What could he be saying, what could this mean? '"But it was impossible to crack them, and it was entirely plausible that there wasn't a code there and that he was just winding people up." The border of Sidebottom's newsletter Com 13 translates as: "The Man From Fish EP is top secret"
In an attempt to solve the mystery, Sullivan eventually turned to GCHQ.The country's top codebreakers too seemed flummoxed until Sievey's son Stirling recalled how his dad would get the children to fill an outer row with random symbols, while Sievey would insert real code into the inner row. "It meant the outer row triangles is a complete red herring," Sullivan said. "Not only did he put a mystery out there, he made it deliberately impossible to crack. "By letting his kids add nonsense into the message, it deliberately obscures the chances of anybody - even top mathematicians - being able to crack it. So I reported back to GCHQ that the outer ring is a red herring and then had an email one day saying, 'Right, we've cracked it during a light-hearted training exercise. '"I'm embarrassed to say, on the very next day Chris's very own code grid was found in the back of his address book. 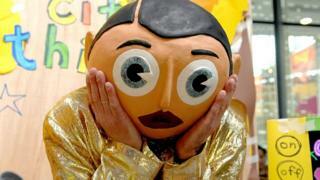 It was almost like Chris Sievey was going, 'There you go, now we've all had our fun, there's the explanation.'" GCHQ told Sullivan that Sidebottom "had a small but dedicated following" among its staff. Noticing some repeated pairs of symbols - which represented letters - the first word cracked by GCHQ boffins was Sidebottom's favourite word, "bobbins".The full messages didn't turn out to be crucial to national security. They were "a combination of slightly autobiographical statements and silly statements about Frank's world", Sullivan said.As well as "Why does my nose hurt after concerts? ", another typical code translated as: "The Man From Fish EP is top secret. "Sullivan said he has "absolutely no idea" what that means.Sievey never told his fans about the existence of the codes, despite the fact that the symbols were inserted into newsletters, music sleeves and football programmes for Timperley Big Shorts, his Sunday league team. "It was just an exercise in wilful absurdity, which is why he was doing it," Sullivan said. "But then all of his work was an exercise in wilful obscurity and absurdity. I think he loved the idea that he was putting communication out but people didn't even know he was communicating." GCHQ had "a great sense of humour about the whole investigation", the director added.A GCHQ spokesperson said: "As the national authority for cryptanalysis, we're sometimes sent codes which the team will test themselves with in their spare time. "They provide us with a great challenge and help build the skills we need to keep the country safe. "With its colourful drawings and striking patterns, this code caught our eye and it was satisfying to be able to break it. "All of Sidebottom's codes will be available for fans to work out for themselves when Being Frank is released on DVD on 29 April.Follow us on Twitter @BBCNewsEnts, on Instagram at bbcnewsents, or email entertainment.news@bbc.co.uk.